Sri Lanka has produced in this century a brilliant band of supermen with a vision, mission and a mandate who have by their sublime thoughts, power-packed words and dazzling deeds attained immortality. To this select group belongs Sumathi Abeywickrema, Attorney-at-Law, Notary Public and former Registrar of Lands and father of Air Force Commander, Air Marshal Harsha Abeywickrema who passed away recently at the age of 87 after a brief illness at his residence in Pepiliyana, Dehiwela. Abeywickrema, who was a multi-faceted and multi-dimensional personality was a devout Buddhist and valued Buddhist customs. But, he also extended and supported other religious activities, since he was always of the opinion that religions are not contradictory, but they are only complementary. In fact, he rose above narrow parochialism, regionalism, sectarianism and communalism and treated everyone as human beings and valued truly human and human qualities. Indeed, I had the rare opportunity, honour and privilege of associating closely with Sumathi Abeywickrema in the early part of the 50s when he was employed at the Anuradhapura Kachcheri. My father late M Chelvathamby who was practising as a Proctor at Anuradhapura had a liking towards him and gave accommodation for him to stay with him. My father treated him like his own son and fulfilled all his needs. Besides, my father played a key role to bring about his marriage to Elsie, an English trained teacher who hailed from a distinguished family in the Southern part of Sri Lanka where her father late L P G Gunawardena was Vidana Aratchi. Further, during our school holidays, myself and my younger brother Sriskandarajah who is an Advocate and Solicitor in England now, used to go to Anuradhapura to spend our school holidays with our father. During those days Abeywickrema not only treated us like his own brothers and taught us English, since he was an English scholar. In turn we taught him Tamil since he was very much interested in learning Tamil. Now only we talk about trilingual, but Abeywickrema learnt Tamil in the early part of the 50s and was competent in all three languages. 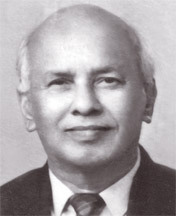 In fact, this helped him immensely for him to build a bridge between North and South and he had several Tamil friends. Abeywickrema was always of the view that it is wrong to discriminate against a person on grounds of ethnicity, creed and language. He always showed friendly goodwill, mutual understandings and steadfast faith towards each other. Besides, his face was always lit with a smile and compassion. Indeed, he was a man of gold and his mind was a mansion of noble thoughts. He was always free from jealousy, envy and hatred since he always practised the Buddha’s teachings. He was a strong Buddhist who treated Buddhist monks with great respect and veneration. Recently I happened to meet a highly respected and educated scholar monk by the name Ven Horowpothane Sathindriya Thera at Abeywickrema’s residence at Piliyandala. He told me that he met Abeywickrema 20 years ago at the Maharagama Bhikkhu Training Centre and ever since Abeywickrema’s family had helped him fantastically and fabulously in various ways. Abeywickrema wanted even his own children to follow the Buddha’s teachings and philosophies. That may be the reason even his son Air Force Commander, Air Marshal Harsha Abeywickrema follows in his father’s footsteps and leads a highly disciplined and excellent life. Furthermore, he mentioned that President Mahinda Rajapaksa is a true leader with steps to bring about peace and harmony among all communities and denominations. In fact, his ten-year programme for trilingual Sri Lanka should be highly commended and it is a historic one and a boon to Sri Lanka’s youth. Furthermore, Abeywickrema believed that human love and mutual trust can only overcome all barriers of caste, creed and religion. The greater ideal expressed by the Buddha is Ahimsa Dharma which was followed by great leaders like Mahatma Gandhi and Martin Luther King and several others. Abeywickrema was always of the opinion that tolerance, patience and endurance are the foundation for peaceful society. In fact, he followed these lofty ideals throughout his life and maintained tranquility, equanimity and serenity of mind without being disturbed and unperturbed. He led an undaunted life due to his Buddhist teachings and made even his children to follow these principles in life. Abeywickrema was born on September 24, 1925 in a family of three brothers and four sisters. He received his primary and secondary education at Weragoda Bilingual School and Sri Pali, Horana. On completion of his higher education, he joined the Central Clerical Service and worked in Balapitiya, Kandy, Anuradhapura, Colombo and several places. While he was working at Colombo Kachcheri, he entered the Law College and passed out as an Attorney-at-Law and after retirement from the government service, he established his own legal firm and helped several people. Abeywickrema was a livewire and whatever he touched or undertook, he put new life into it and made it a living institution whether as a public, social and religious worker. Everywhere we could see, not only the imprint of his personality and the versatility of his genuine, but also the sign of the livewire that he was, gave life to everything he touched. Verily, no field of human endeavour was left untouched by the swaying amplitude of his imagination, the encompassing sweep of his thoughts, the penetrating, yet lucid felicity of his words and the indefatigable zeal of his actions. In the rat race that pervades and permeates the Sri Lankan’s Buddhist activities Abeywickrema’s name stands out as a glorious exception. He was not cribbed, cabined and confined by any limits of caste, creed, colour and convention. Indeed, the Buddhists of Sri Lanka will ever remain grateful for the remarkable contributions and selfless service rendered by him for the propagation, promotion and development of Buddhism. He was a Buddhist to the marrow of his bones. His wife, late Elsie Abeywickrema was a tower of strength and a source of encouragement in all his endeavours. Being a brilliant product of Christ Church Girls’ College, Baddegama and an English teacher, she excelled both in studies and sports and was captain of the athletics team and Head Prefect of the College. Besides, being an English teacher, she was very much involved in textile manufacturing, printing and making of garments in Piliyandala and provided employment for several poor girls. Indeed, Abeywickrema and his wife Elsie Abeywickrema were an idyllic couple intrinsically blended into one being, finding comfort, solace, happiness in each other through all the hazards and hassles of life. They were blessed with one daughter and four sons. His daughter Kumudini has indeed helped her father immensely and looked after him with loving care during the evening of his life. She came all the way from New Zealand to look after her father ever since he fell sick. She always follows the teachings of the Buddha and believes that looking after the parents is a meritorious deed and she should be highly commended for her lofty ideals. Undoubtedly, Abeywickrema was literally a comet who blazed momentarily across the skies, leaving in its trail a luminescence which the passing of time can hardly erase. The consolation for all of us is that ‘Death is no respecter of persons and we would only refer to death as depicted in Buddhist scriptures ‘Jeewithan aniyathan, maranam niyatham’. ‘Life is uncertain, death is certain’.